Aboriginal resistance was mostly economic sabotage. Realizing livestock were the lifeblood of the newcomers, and experiencing dwindling food sources as settlers shot wild game, Aboriginal groups chose to frequently disperse, slaughter or maim as many cattle and sheep as they could – often by the hundreds. They similarly raided and destroyed crops, supply drays, pasture and food stores. Some Aboriginal raiders began to live on pillaged livestock and crops. They constructed makeshift ‘bush pens’ in secluded places, to keep flocks for later consumption. This tactic was very effective and was utilized all over Australia. Many Europeans were forced to abandon or sell their holdings on account of the continued losses and harassment. 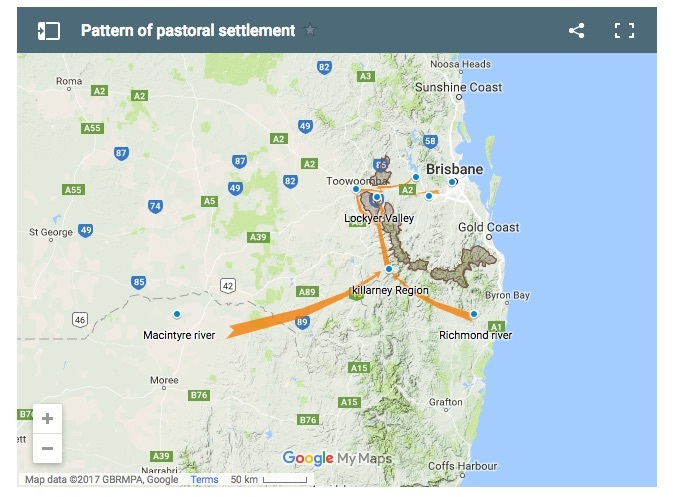 Indeed, when the Upper Brisbane and Lockyer areas were reclaimed, the main activity was dispersing and destroying livestock. The Sydney Morning Herald reported: “From their manners, and the partial conversation they have had with the white inhabitants, they seem determined to annihilate if possible the whole of the stock in the district” (10 Sept 1844, 4). Similarly, Multuggerah (one of the leaders) advised John Campbell (an early settler) that his group and their allies intended to “starve out” the settlers. Outstations were the ‘forward arm’ of encroaching settlement. They marked the edge of every frontier. A run’s livestock were mostly corralled here. Many outstation staff were itinerant workers or ex-convicts who in some cases took advantage of local Aboriginals, especially the women. For all these reasons, the most frequent and violent Aboriginal attacks targeted outstations and the staff of outstations (hut keepers, shepherds) were the most usual victims of attacks. In attacks on the Upper Brisbane, Darling Downs, Wide Bay and Lockyer, there were repeated cases of outstation staff (usually two or three men but sometimes several) being held in siege for days by an inter-tribal force of hundreds of warriors that had been called in through smoke signalling and other means. The warriors usually persisted in attacks until they managed to evict or kill the occupants and burn their huts and stores. 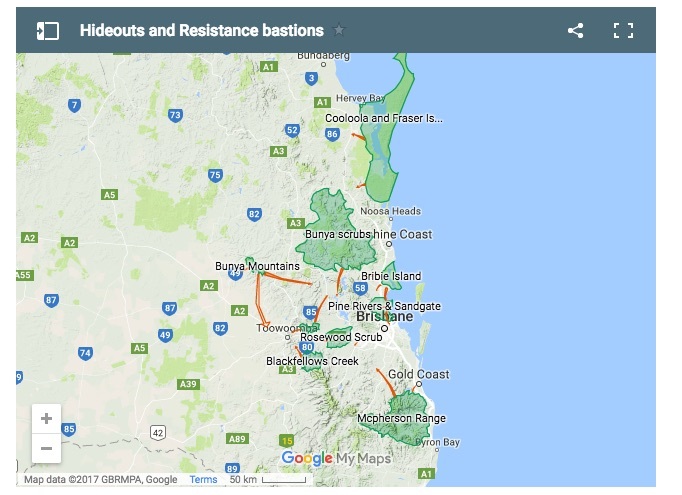 Sometimes several neighbouring runs were attacked in coordinated efforts (for instance, around the MacPherson Ranges and Lockyer), or the settlers were chased from run to run (as happened at Kilcoy and Cressbrook). Such attacks were in many cases successful for a while. Another common tactic was threatening, attacking, robbing or killing travelers and dray (bullock cart) drivers. This included controlled burns, throwing spears at passing vehicles and conducting aggressive or abusive displays. The aim here was to disrupt and dissuade communication and transport, and reduce the flow of supplies in and out of newly settled areas. Figure 4: Bullock Drays were often attacked, being the ‘trains’ of the early frontier – carrying supplies, produce and workers to and from the runs. Firing was part of Aboriginal land-management. Sometimes settlers mistook this for aggression. However, in certain cases the acts were deliberate. There are several cases where intense firing dissuaded would-be settlers from establishing themselves, or forced them to move their flocks away on this account. John Campbell recorded that Aboriginal parties considered the killing or driving away of horses as a victory, as they realized that settlers needed these to attack them or escape. Often when outstations were attacked the horses were also driven away. For similar reasons, and because Aboriginal groups understood the importance of European letters (as they were often employed as letter-carriers and witnessed the results of such messages), there were several cases where mailmen were robbed or killed. This occurred on Stradbroke Island, near the Bunya Mountains, on the Logan, the MacPherson Ranges, and Wide Bay. Figure 6: One-off killings were very unpredictable, which aroused much fear. The target might be watched and tracked for weeks or even years until an opportune moment presented itself. Finally, Aboriginal groups relied a great deal on single, targeted killings. This was usually payback against specific settlers for specific infringements. Often a traditional revenge party or executioner was assigned to this task, which could occur at any moment, in a sudden, surprise attack. The unpredictable nature of these killings worked extremely well in inciting terror. It was difficult for pastoralists to hire or retain staff in any place that developed a history of such killings. The actions of Dundalli between Brisbane and Caboolture were largely payback killings of this sort. At first, aside from a few initial killings on both sides born more of fear than design, most Aboriginal groups simply stayed out of the way of Europeans. Resistance took some months or years to build. Following the Kilcoy massacre (February 1842), some 14 groups met during the “great toors” (large meetings) of 1842 and 1843 around Wide Bay and Sunshine Coast hinterland. They decided to jointly fight against settlement, vowing to “kill all whites they came across.” Word of this threat raised the fears of settlers, but in practice, killings were only enacted against particular individuals. Certain explorers and missionaries continued to freely visit, and Simpson toured much of the district during the height of this threat with a party of border police and had no encounters (presumably meaning the groups kept out of his way). Aboriginal leadership even within a single group is mostly communal rather than singular (i.e. there was more than one leader). Each group had many factions and diverse opinions, much like American Indian tribes. Consequently, resistance went through a complex history, although there were several leaders that enjoyed unusually wide support – e.g. Commandant, Mulrobin, Moppy, Yilbung and Multuggerah. From 1842 to 1846, large areas of the Upper Brisbane Valley, Lockyer Valley, Darling Downs and Wide Bay were sporadically reclaimed. Wide Bay was reclaimed for 3 years – the first settlers here being entirely evicted. 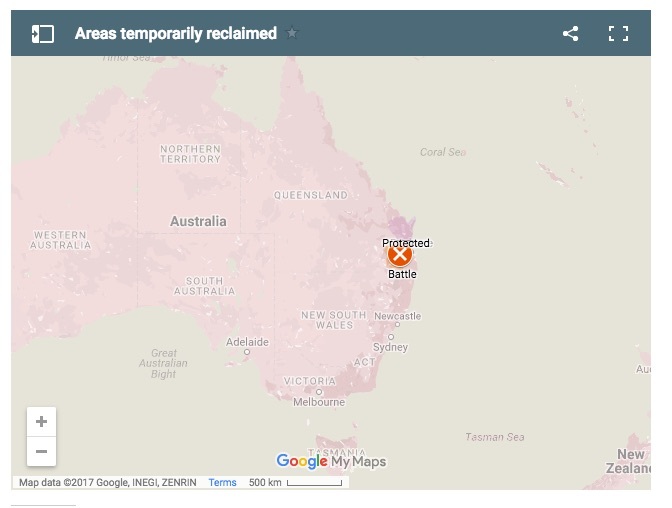 Much of the other areas listed here were held in siege for weeks or months at a time, but eventually (after 1848) only particular pockets were still nominally in Aboriginal hands – for example, the Bunya lands, the area around Blackfellows Creek near Gatton, and Rosewood Scrub. Even many of these areas were technically held by a white owner, though in such cases the owner did not activate his use of the area. A major area to be ‘reclaimed’ occurred not through violence but through diplomacy. In 1842, Andrew Petrie, who was an ally of local Aboriginals, pressured the New South Wales Governor Gipps to declare a large section to the north of Brisbane a Reserve for the exclusive use of Aboriginal groups, as the importance of the area for inter-tribal gatherings and feastings on bunya nuts was recognized and the Governor wished for the Aboriginal groups to be able to continue their lifestyles. The area was never clearly defined but ran roughly from the Glasshouse Mountains to the North Maroochy River. The Reserve was to enclose all the bunya forests. At the time, bunya groves were only known on the Blackall Ranges but they were soon after discovered on the Bunya Mountains. Consequently, the Reserve ran for an undetermined extent west. Bunya groves as far as the Bunya Mountains continued to be protected into the 1870s. The unexpected effect of this Reserve was to create a safe haven for Aboriginal resistance. Hostilities broke out within months of this proclamation on account of the Kilcoy massacre. The Bunya Bunya Reserve was soon seen by colonists as an entity that protected and supported Aboriginal hostility, especially when inter-tribal meetings here were regularly employed to plan attacks on whites. Although the ban on settlement in this area was maintained, border police and later Native Police were sent on patrols into the Bunya Bunya Reserve to break up (‘disperse’) gatherings and hunt for particular leaders. In 1860, one of the first moves of the newly-formed Queensland government was to scrap the Reserve. Figure 10: Arenas Of Conflict 1840s-1850s. Red Dots Mark Head Stations; Small Squares Mark Towns. Hatched Areas Indicate Areas Used As Refuges During The Conflict, And Yellow Bands Mark Areas Of Most Frequent Frontier Hostilities. 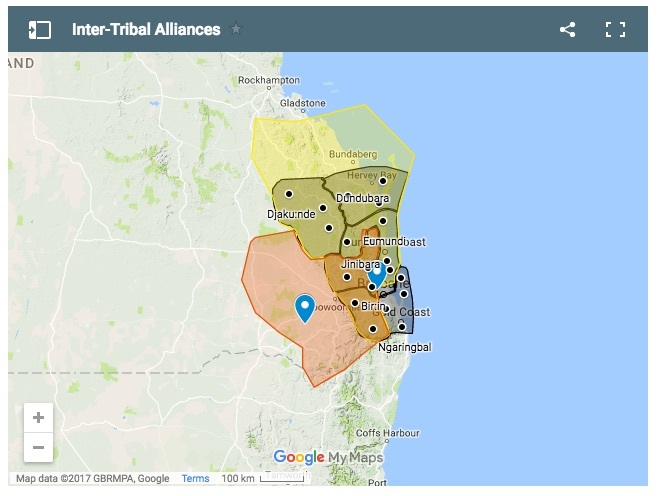 Generally, hostilities erupted on the edges of Upper Brisbane Valley, Lockyer Valley, the Pine Rivers / Sandgate area, Caboolture, parts of the Mary Valley, the Scenic Rim and a few sections of the Darling Downs. This was mostly adjacent to favoured hideouts or strongholds.